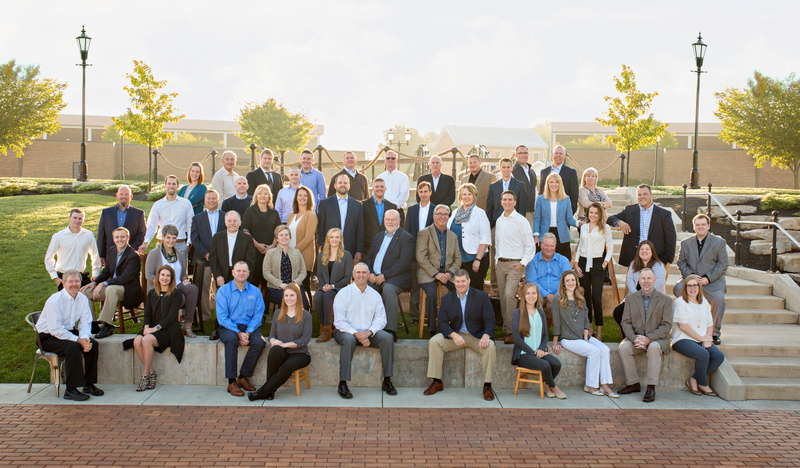 With over 50 professionals, Garmann/Miller is one of the largest architectural and engineering firms in Ohio. Our in-house disciplines include Architects, Interior Designers, Plumbing/Mechanical/Electrical Engineers, Landscape Architects, Technology Designers, Construction Administrators, Graphic Designers, and support staff. This creates a one-stop solution for all your building and renovation projects. Our knowledge and experience bring exceptional quality to your project, from needs assessment and conceptualization through construction. At Garmann/Miller, we understand the impact a building project has on its community. After all, the product of our efforts will be here for many generations to come. The firm believes strongly in producing high quality documents, and providing a high level of customer service, all while delivering a project within your schedule and budget. Garmann/Miller’s success has been the result of a strong work ethic, our ability to listen to our clients, and customer satisfaction. Brad is one of the founding principals of the firm. He is a graduate of Miami University. Bruce is one of the founding principals of the firm and has 34 years experience. He is a graduate of The Ohio State University. Eric is an electrical engineer and CEO of Garmann/Miller. He a graduate of the University of Toledo. Chris is a mechanical engineer. He is a graduate of Edison Community College and Wright State University. Matt is an architect and a graduate of Miami University and Ball State University. Ben is an electrical engineer. He is a graduate of the University of Dayton and Wright State University. Elaine is a controller and director of human resources. She is a graduate of Wright State University. Becky is an interior designer. She is a graduate of Indiana University. Michael is an architectural designer and a graduate of the University of Michigan. Juliana is part of the business development team and an administrative assistant for the Garmann/Miller team. She is a graduate of the University of Dayton. Karrie is a interior designer and a graduate of Ringling College of Art & Design. Wayne is a senior planner. He attended the University of New Hampshire with a major in marketing/business management. Kasey is an architect and a graduate of the University of Kentucky College of Architecture. Mitchell is a site designer and a graduate of The Ohio State University. Michelle is an accountant and a graduate of Miami University. Tom is a construction administrator. He is a graduate from The Ohio State University. Shira is a landscape architect. She is a graduate of The Ohio State University. Hannah Fleck is an interior designer and a graduate of Kent State University. Jason is a construction administrator. Gina is an architect and a graduate of Miami University and Florida State University. Randy is a BIM manager and a graduate of the University of Toledo. Ryan is a designer and a graduate from Ball State University. Steve is an electrical designer. He is a graduate of the University of Dayton. Daniel Hogenkamp is a mechanical designer and a graduate of Trine University. Hannah is a designer and a graduate of Miami University. Andrew is a mechanical engineer and a graduate of the University of Dayton. Matt is a mechanical engineer and a graduate of The Ohio State University. Dylan is a mechanical designer, and a graduate of Wright State University. Laura is a project manager and a graduate of Sinclair Community College. Kellen is a landscape architect and a graduate of The Ohio State University. Ashley is a mechanical designer. She is a graduate of The Ohio State University. Ted is an architect and a graduate of the University of Notre Dame. Mandy is an architect and a graduate of the University of Notre Dame. Dan is a construction administrator and a graduate of Bowling Green State University. Craig is a specification writer. He graduated from Bowling Green State University and the University of Toledo. Sara is a site designer. She is a graduate from The Ohio State University. Cindy is a designer and a graduate of Columbus State Community College. Jacob is a tehcnology designer and a graduate of Ball State University. John is a registred architect. He has attended The Ohio State University and Columbus College of Art and Design. Doug is a communication and marketing professional with the firm. He is a graduate of Wright State University and Auburn University. John is a Technology Designer and a graduate from Clark State Community College. Kevin is an electrical designer and a graduate of Wright State University. Ron is a designer and a graduate of ITT Technical Institute. Chad is an electrical designer and a graduate of Wright State University. Kristi is the marketing coordinator and an administrative assistant for the Garmann/Miller team. She is a graduate of Bowling Green State University. Gail is an architect and a graduate from Ball State University. Curt is a project manager and a graduate of The Ohio State University. Rob is a Construction Administrator and a graduate from The Ohio State University. Jamee is a graphic designer and a graduate from Sinclair Community College. Kathy is a landscape architect and a graduate of The Ohio State University. Jim is an architect and director of buisness development. He is a graduate of the University of Michigan and Kent State University. Greg is a BICSI Technician and a graduate from DeVry University. Lee is an engineering designer and a graduate of ITT Technical Institute. Brian is a project manager and a graduate of Miami University. Katie is a designer and a graduate of Bowling Green State University and Washington University.